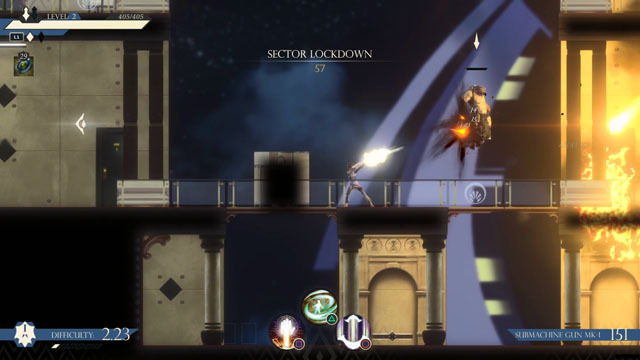 Seraph, from Dreadbit, is an acrobatic platforming shooter starring an angel named Seraph who is trapped inside a human body and imprisoned. Fortunately, she has has mastered the art of "Gun Fu" (a term sure to tickle the fancy of Joe Bob Briggs), and uses these skills to take down legions of demonkind as she makes her escape, attempting to keep her mortal vessel alive in the process. The game features procedurally generated levels, enemy layouts, and loot drops, requiring players to stay on their feet - or in the air, anyway - and the difficulty level scales along with the player's abilities for a bit of extra demonic punishment. However, the game is not a roguelike, and the player can activate checkpoints in order to continue the game should he fall in battle. Seraph makes use of a wide variety of weapons to blast away enemies with an auto-aim feature that allows her to jump over baddies and leap between platforms while unloading sprays of bullets and dodging enemy fire. Seraph is now available for PC via Steam, and is also planned for release on PS4 later this year.